Rating: Loved -- I couldn't put this down. Did I finish? : Oh yes -- I really couldn't stand not reading it! One-sentence summary: Small town Michigan girl May Dugas seeks love and a comfortable living -- and finds herself branded the most dangerous woman in America. Do I like the cover? : I love it -- I don't quite think it has anything to do with the story, really, but the color and arrangement is striking. First line: I believe, dear reader -- and these words come from the bottom of my heart -- that I can truly trust you. Do... I love the author's website? : YES. It is loaded with extras, like a reader's guide (an info on how to invite her to speak with your book club! ), Parlor Talk, in which our heroine May gives dubious advice to the lovelorn, and an annotated list of the author's favorite books on writing. Buy, Borrow, or Avoid? : Borrow or buy, especially if you love dramatic, unreliable heroines, the Gilded Age, and soap opera-like plot twists. Why did I get this book? : The cover. The setting. The Pinkertons! Review: I just loved this book. Loved, loved, loved. It was flippant and fun, total escapism, with a minxy heroine I adored from the first page, a long list of exotic locales to divert, and piles of dramatic intrigue to keep me engaged. Set in the late 1880s through 1910s, the story follows May Dugas, a small town Michigan girl with a foxy figure, clever mind, and an impatience with ordinary life. Told in first person, May's 'voice' is sophisticated, wily, artificially innocent, glib. May reminded me of Lola Montez, another notorious adventuress with lovers and scandals trailing behind her like the train on her dress. May's story strains credulity until you remember, like Ms. Montez, May was a real woman. Biaggio does a wonderful job of making May's escapades seem feasible, albeit excessive, and I was with her every ill-timed, poorly-conceived, and ambitiously bold step of the way. I think this would make a wonderful audiobook due to the first-person narration and May's lively tone. Despite May's sexual prowess, this book is light on tawdry details, so no need to worry about detailed or flowery descriptions of her and her lovers. In the end, this was a straight up enjoyable novel -- the kind of book that sucked me in, made me miss my subway stops, and had me reading as I walked up the sidewalk home. If you like your hist fic with a hint of grandeur and a heavy dollop of drama, consider this! 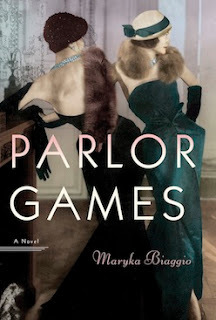 I'm thrilled to offer a copy of Parlor Games to one lucky reader. To enter, fill out this brief form. Open to US/Canadian readers, ends 2/15. For another chance to win, see the interview with the author. May sounds like a fantastic character! Thanks for the review and giveaway! Such a treat -- definitely a favorite for 2013! Heather, your comments always make me so happy!! You're way better than the mock complimentary spam comment I got all (erroneously!) excited about. ;) I think you will looooooooooooooooove this one -- hope you get it soon and let me know what you think! Anyway - love the review, love the strong heroine aspect, can't wait to get a copy! Jessie, as I said on GoodReads: grrr on the expiring ARC! So frustrating. However, this one is worth the splurge -- so good! It was wonderfully fun -- so breezy and easy and only slightly sleazy!! This sounds interesting, like the dual narrative time frame will really work. Thanks for the recommendation! It was really interesting -- a wonderful snapshot of late 1890s life in the western US, among other fun details -- hope you get to read tihs one! I've been wondering about this one but have waited to read some reviews before deciding to read it. Sounds like it is a winner! The lukewarm reviews astound me -- I found everything about this book to be wildly fun. It was a total winner for me! I loved the cover on this one too and on that basis alone put it on my goodreads list. But now after your review I must have it! Oh, it sounds delightful! I'm entering the giveaway. I've been hearing a lot of good things about Parlor Games. I'm totally in love with the cover too! Awesome review. I want to read it simply from your review. I'd been circling this book for a while, but it both sounded intriguing and a bit out there for the time period, lol. But your ringing recommendation has convinced me to nab a copy! Love the cover...sounds like a great book.